No complete bladed weapons have been recovered from Queen Anne’s Revenge, but a few broken parts hint at the styles of weapons onboard. A delicate copper alloy cross guard would have attached the blade to the handle of a sword, and served to protect the hand from a slice from an opponent. The blade was completely corroded, but a portion of it was able to be preserved with epoxy. The faces on both sides of the guard have not been specifically identified, but they represent a style known as Régence style (not to be confused with Regency of the late 18th and early 19th centuries) popular in Western Europe during the late 17th century. During cleaning, it was observed that the guard may have been gilded with a thin layer of gold, but only a small sample survives. The antler grip of a sword is missing the guard and everything above, but has been identified as an English hanger (or cutlass) from the 1680s or 1690s. 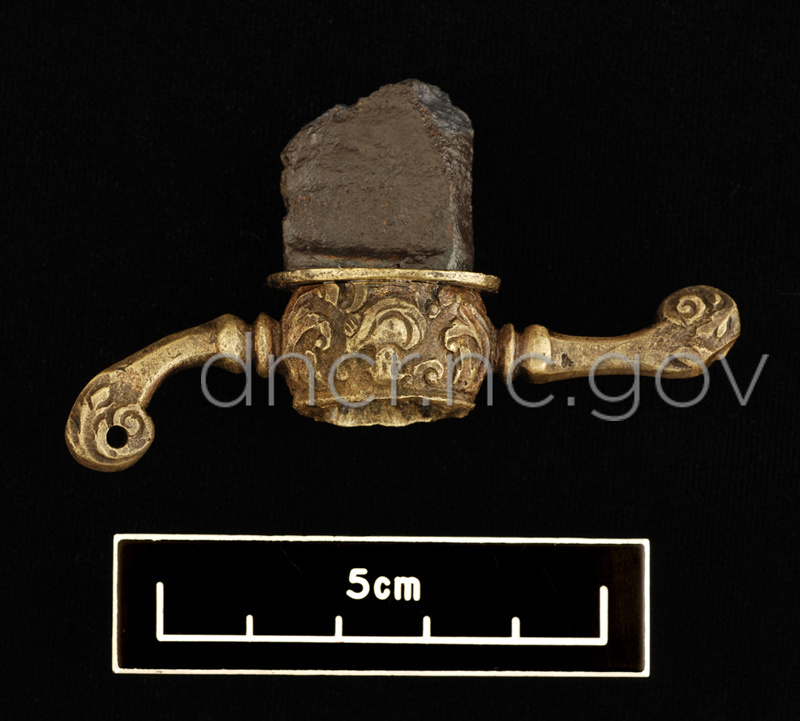 It is made of antler of a male deer, called “hartshorn,” and has a copper alloy ring where the guard would attach and a copper alloy cap or pommel at the end. The pommel features two fleur-de-lis and two unidentified faces, which on a similar sword at Colonial Williamsburg represent William and Mary. A pewter dirk, or long dagger, handle was recovered. Like the sword no blade has survived, as wrought iron is highly susceptible to corrosion. Delicate geometric wooden inlays are surrounded by incised designs in the pewter.